Previous books have promised to describe the combat experience of the World War II GI, but there has never been a book like Patrick O’Donnell’s “Beyond Valor.” Here is the first combat history of the war in Europe in the words of the men themselves, and perhaps the most honest and brutal account of combat possible on the printed page. For more than fifty years the individual stories that make up this narrative — shockingly frank reflections of sacrifice and courage — have been bottled up, buried, or circulated privately. Now, nearing the ends of their lives, our WWII soldiers have at last unburdened themselves. “Beyond Valor” recaptures their hidden history. A pioneering oral historian, Patrick O’Donnell used his award-winning website, The Drop Zone, to solicit oral- and “e-histories” from individual soldiers. Gradually, working from within the community, O’Donnell convinced some of the war’s most battle-hardened soldiers to tell their stories. The result is WWII seen through the eyes of the men who saw the most intense of its action. 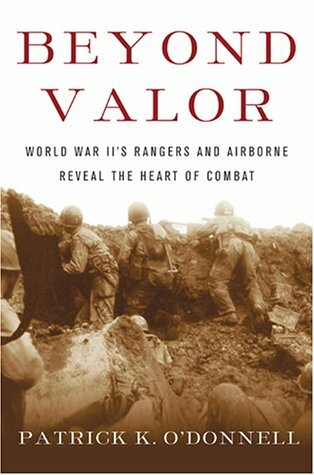 O’Donnell focuses on the elite units of the war — the Rangers, Airborne, and 1st Special Service Force — troops that spearheaded the most dangerous operations and often made the difference between victory and defeat. From more than 650 interviews O’Donnell has chosen oral- and e-histories that form a seamless story line, a pointillistic history of the war in Europe from the first parachute drops in North Africa through the final battles in Germany and the long trip home. It is the story of the war not discussed in polite company. O’Donnell presents the wreckage of entire battalions nearly annihilated, invisible personal scars, and hauntingrevelations of wartime atrocities. But more important are the men who recount lives risked without hesitation for comrades and cause, and those who did not return: the friends who died in their arms. Their stories remind all of us that victory came only at the highest price. Remembering the infamous cliffs at Pointe-du-Hoc, bloody Omaha Beach, the bitter fighting at the Battle of the Bulge, and Hill 400 in the Hurtgen Forest, the soldiers reveal war as seen, heard, and smelled by the GIs on the front line. Also included is the unique story of the 555th Parachute Infantry Battalion, and the trailblazing African-American “Experimental” Test Platoon that had to fight its own battle behind the lines. “Beyond Valor” captures the truths that exist among soldiers. It is one of the most inspiring accounts of the war ever produced.